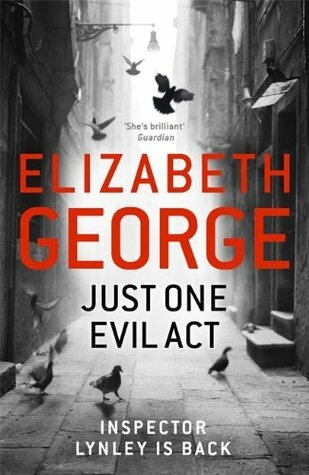 The last time I wrote about Elizabeth George here, after reading 2008’s Careless in Red, I said that “I turned to these latest instalments [in her series] motivated far less by curiosity about the latest corpse than by the desire to know how things are going” with her main characters: Thomas Lynley, Barbara Havers, Simon and Deborah St. James. I was tiring of the detective plots that ostensibly motivated the novels but that really just provided an excuse and an occasion for personal stories and character development. Then with 2012’s Believing the Lie I admitted that these private lives were also becoming a bit stuck for me: so much angst, and so many words (I have thought for a while that George’s books aren’t getting edited as stringently as I’d like). Still, she’s a writer I trust enough to keep trying — as I kept on going even after the disaster that was 2006’s What Came Before He Shot Her (a good enough idea, but, in my opinion, really unsuccessful in the execution). We’ve been in a reading relationship since 1988, after all: that’s a lot longer than I’ve known most of my actual friends, or my husband, for that matter. This weekend I caught up on her latest, Just One Evil Act, and it made me glad I’ve stuck with her and this series, because I really enjoyed it. I think one reason it worked so well for me is that it combines case and characters: the crime story is a big tangled mess involving Barbara Havers’ friends and neighbors Taymullah Azhar and his (maybe a little too sweet?) daughter Haddiyah. The more Barbara in the case the better, usually (Deception on His Mind, in which Barbara operates solo, is one of the most interesting books in the series), and in this case her annoyingly endearing bulldog tendencies have a certain poignancy because she really has no other friends, so her attempt to find out what has really happened has an urgency that transcends professionalism. Not that Barbara usually toes the professional line, of course, but sometimes she just seems defensive and stubborn, whereas here she is defensive and stubborn and really vulnerable. An ongoing theme of the series is loyalty, too, and here it’s not just her devotion to her friends that drives the plot but Lynley’s to her that is tested (again) to the limit. I also enjoyed following the action to Italy: much of it takes place Lucca, which looks as lovely as George makes it sound. It was kind of a two-for-one deal, a Lynley novel plus a Donna Leon mystery, all in one! I wonder if one reason I’m slow to pick up new mystery series these days is that I have been reading the same ones for so long — between Rebus and Kinsey and V.I. and Lynley and Dalgliesh (and, less faithfully, Banks, and Kincaid / James) I just don’t have room in my heart for many more! That’s not to say I haven’t read mysteries I’ve liked recently (I have Dorian and others to thank for putting me on to Tana French, and I’ll probably keep up with any new ones in Kate Atkinson’s Jackson Brodie series, for instance), but I have sampled a lot of others and just not felt inspired to go steady with them, even if they struck me as pretty good. It’s not altogether bad to know they are in reserve! I can have a big Maisie Dobbs phase later on, when some of my old standbys have retired. I think you should expand this into an essay on our readerly attachments to series! Hmm – food for thought! It is a really important feature of detective fiction, I think, because there are limits on character development for everyone in a particular case, so the series characters are the ones we get deeply invested in. I wasn’t as convinced by this as you, I’m afraid. I felt that George had tried to get too much into one novel and I stopped believing about half way through. I did get to the end but it was only devotion to Barbara that got me there. I lost track of this series after, I think, the fourth book–so a long time ago. But I know what you mean about not wanting to pick up a new series. Right now, I’m committed to keeping up with Mary Russell and Jackson Brodie and probably any additional Stuyvesant Grey novels from Laurie King. Plus, there’s my project of reading all the Campion novels. I could probably manage a couple more, but none of the others that I’ve sampled have caught my interest for the long term. I have a couple of longer series in mind for when I finish Margery Allingham, but I prefer to get in near the beginning so I have a hope of catching up!